Making the most of recruiting data can be a tall order for any talent acquisition team, but wherever your starting point, having the right mindset about what you hope to accomplish with reporting can set you on the right path. Slice and dice data to get to the root of the result. Thinking a level deeper can push your recruiting strategies forward. With flexible reporting fields, create multiple reports that help get to the core cause behind the number or pattern displayed in an initial report. Keep a real-time pulse on your metrics. An up-to-the-minute view of metrics empowers you to make more agile decisions. From your recruiting system’s dashboard, keep tabs on which sourcing channels are generating the most applicants to allocate resources appropriately. Mix a narrow focus with the big picture. Talent acquisition has a lot of data at its fingertips, but to get the most accurate analysis of how things are going operationally, it needs the ability to both drill down to the specific (like the average time it takes for a recruiter to fill roles in a certain department) and the general (let’s say, the company’s average cost-per-hire for the month). Additionally, companies on a fast-growth track are likely using more than one piece of technology to manage their talent acquisition efforts. They might be relying on a background check provider, staffing agencies, multiple assessment tools, or software to verify hiring compliance. Each of these systems houses some form of data that a recruiter needs to access. When these systems can integrate with each other and compile their information from one point of reference, recruiters suddenly have a full scope of their talent acquisition workflow. So when conversations about HR spending come up, or when there’s a need to craft a unique strategy for a specific position (such as the VP of External Communications), it’s easy to analyze each piece of the reporting puzzle and make an informed decision. Tiered levels of visibility, so that whether there’s a need to get a pulse check on hiring at your Oklahoma branch, or the company as a whole, individual recruiters, HR directors, and executives have the view they need. The ability to configure a report on any field in the system, so that as your company’s needs evolve with your growth (maybe one day you’ll need to report on the average time it takes to complete a version of your application in a different language), you still have the ability to report on it. Quick printing, emailing, or exporting, so that it’s easy to analyze information with colleagues, or demonstrate the business impact of your strategies to company leadership. 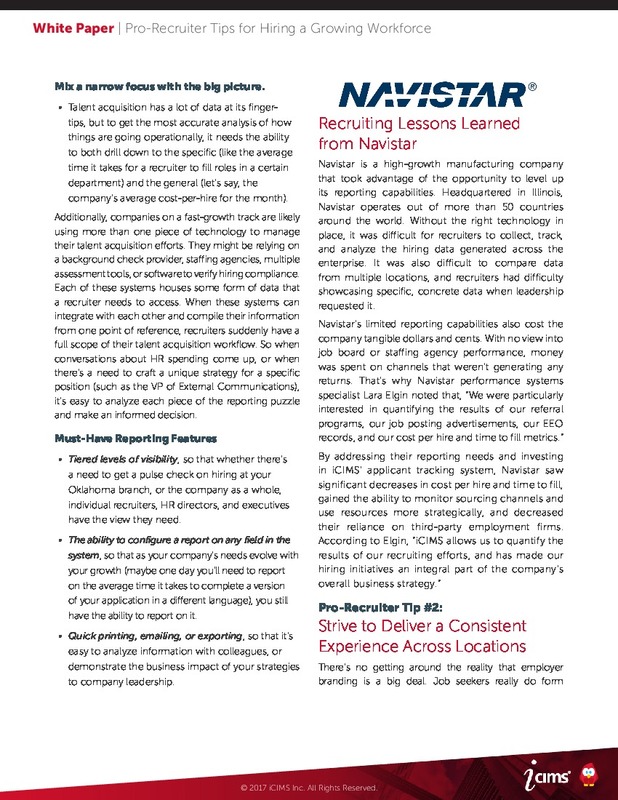 Navistar is a high-growth manufacturing company that took advantage of the opportunity to level up its reporting capabilities. Headquartered in Illinois, Navistar operates out of more than 50 countries around the world. Without the right technology in place, it was difficult for recruiters to collect, track, and analyze the hiring data generated across the enterprise. It was also difficult to compare data from multiple locations, and recruiters had difficulty showcasing specific, concrete data when leadership requested it. There’s no getting around the reality that employer branding is a big deal. Job seekers really do form impressions of your recruiting touchpoints—impressions that can influence the decision to apply or accept an offer. So think about it: is your application easy to complete? Did it make an applicant enter in redundant information, or prevent them from accessing it on a mobile phone? Do your job descriptions and career sites look and sound like your company? Does the candidate get a clear idea of what it would really be like to work for you, aside from the responsibilities of the job? 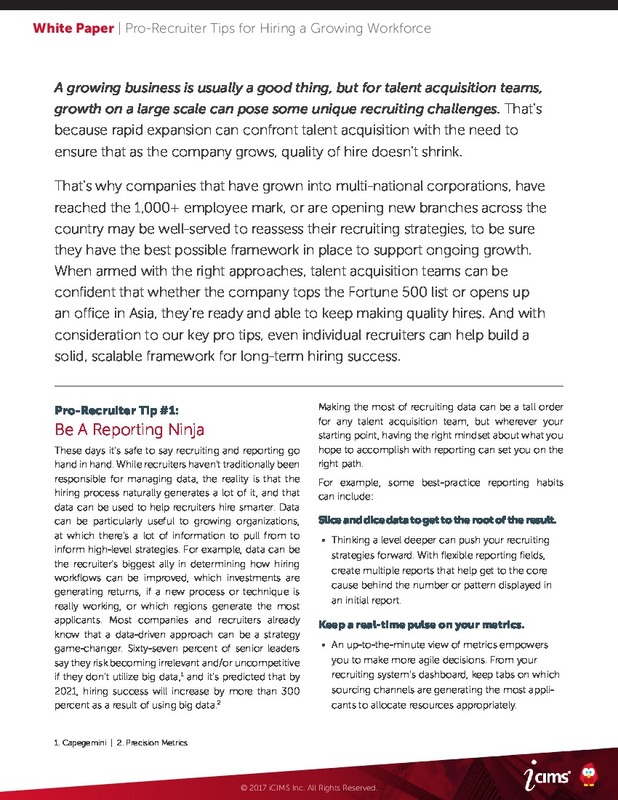 However, for enterprise or high-growth companies, it can be difficult to keep an employer brand on point, as there are no doubt numerous recruiting touchpoints to manage (ex: hundreds of job postings, multiple career sites and pages within those sites, social media profiles specific to various locations…the list goes on). Not to mention, you may be dealing with different application formats and languages for job seekers in different countries. 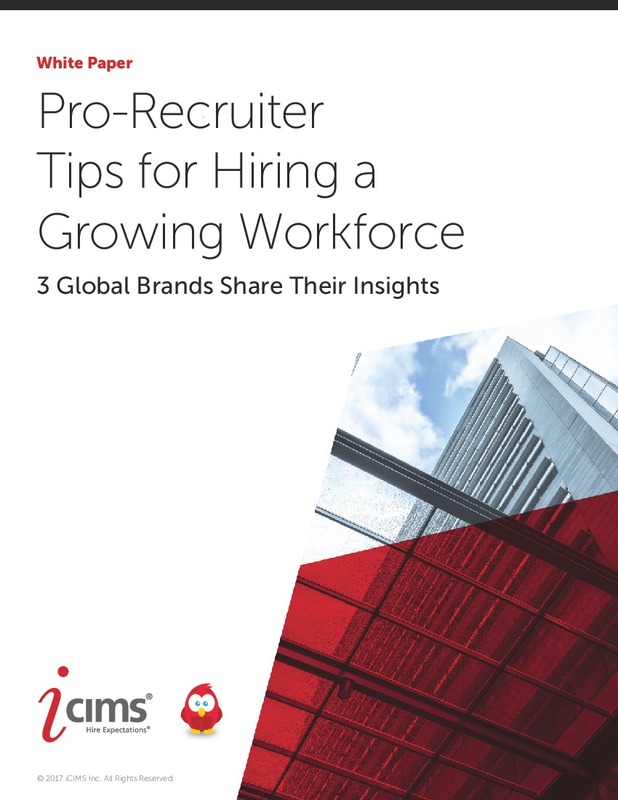 They, too, need an accurate understanding of your employer brand, and a candidate experience that’s on par with any you’d serve up in your flagship country. Consistent employer branding supports your mission to hire for quality, too. By giving all candidates an accurate representation of your company’s opportunities, culture, and values, candidates are in a better position to determine if they would be a good fit for your company. At the core of a consistent experience across your operation is the vehicle you use to deliver it—your technology. Maximize the functionality of your recruiting software to add some standardization to your processes, so that it’s easy for your individual recruiters to stay “on brand” with offer or rejection emails that always reflect your company’s voice, or new career sites that always match the look and feel of your main site, but are still tailored to the region. The importance of a consistent, standardized hiring experience was one well-recognized by ACCO Brands, an office product manufacturer and marketer with more than 6,000 employees. As an international company, ACCO quickly found operating in a manual fashion across multiple locations to be difficult and timely. Without a better solution, ACCO Brands was exhausting time, money, and effort, while inadequately serving the needs of their international applicants. 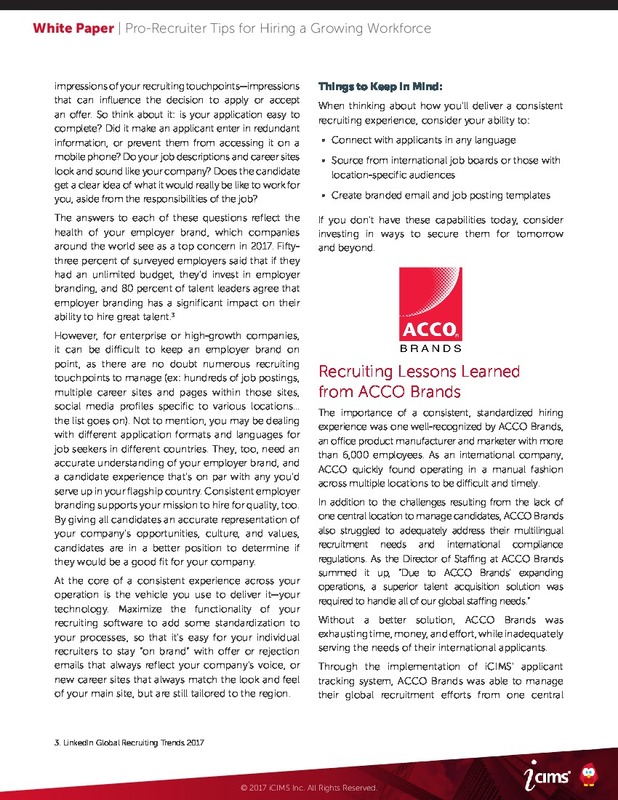 Through the implementation of iCIMS’ applicant tracking system, ACCO Brands was able to manage their global recruitment efforts from one central system, meet international compliance standards, take their entire recruiting operation paperless, and minimize their need for third-party staffing firms thanks to its new in-house multilingual capabilities. Managing talent acquisition processes and systems can be a challenge in and of itself for growing businesses. The approaches that worked so well when the talent acquisition team was a group of ten, or when the business had just hit its hundredth employee, can feel like they’re cracking at the seams when headcount increases and the scope of talent acquisition broadens. Employers often find that staying organized and automating processes in the face of growth becomes paramount. It may no longer be feasible to house all candidate information in email folders or report on workflow status in Excel spreadsheets when the company experiences increased job openings and applicant volume. If you already have an ATS, which many do, recent or anticipated business growth can be an opportunity to explore other options, to determine if there’s a more scalable solution that could increase returns on investment in the long run. Can candidate information automatically be parsed from resumes and imported into your system? If so, are all candidate fields searchable within the system? Can you create email templates and automate their sends to candidates? Can you easily configure your recruiting workflows to meet your needs? Is it possible to automate job postings to a large variety of job boards and social media platforms? Are you able to benefit from bi-directional email, so that all communication with candidates and hiring managers is also stored within your recruiting system? While investing in an applicant tracking system will likely require buy-in from executive leadership, recruiters and HR directors should feel empowered to build a business case in support of exploring the option. For resources on how to get that buy-in, check out our buyer’s guide materials here. 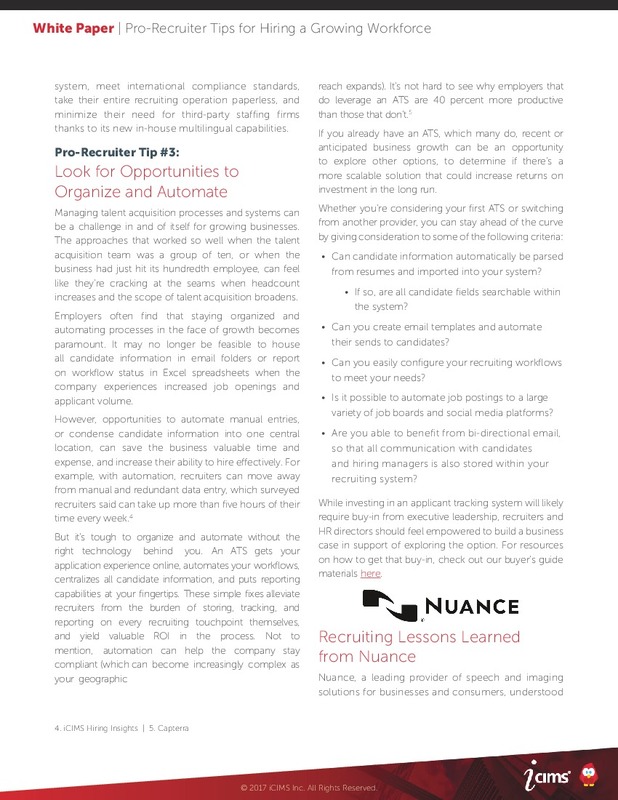 Nuance, a leading provider of speech and imaging solutions for businesses and consumers, understood the challenges of relying on a manual approach to recruiting. With more than 13,500 employees across multiple locations, Nuance struggled to optimize their talent acquisition efforts without the support of the right technology. As Nuance’s former Manager of North American Employment noted, “We would review, sort, and then store applicable incoming resumes in Outlook folders, which were not easily searchable. Just to manage that took over three hours a day.” Nuance was also challenged by a dysfunctional approval process, compounded by language barriers and lack of geographic proximity. These challenges impacted the business in a negative way, resulting in lost candidates, increased time to fill, and misplaced documents that frustrated all parties involved in the hiring process. Employee referral programs can be a helpful way to ensure quality of hire in the face of rapid growth, when it can be easy to extend offers to candidates you’re unsure of just to get positions filled. Though the majority of employers say employee referrals are their strongest source of hire6, only about 60 percent of employers have a formal employee referral program in place.7 If you want the quality hires that come from referrals, investment in a documented referral program (with compelling incentives) is a must. Employee referral programs should be of particular appeal to large companies, because the power of the program increases as your employee count does. The more participating employees, the more networks of family, friends, and former colleagues you have to tap into, and the faster you’ll be able to fill positions with the best people. When you’re recruiting across multiple locations and countries, a standardized program also gives employees the opportunity to make referrals for people who live in another region. In many respects, your recruiting world can get smaller as your employee referral program gets bigger. 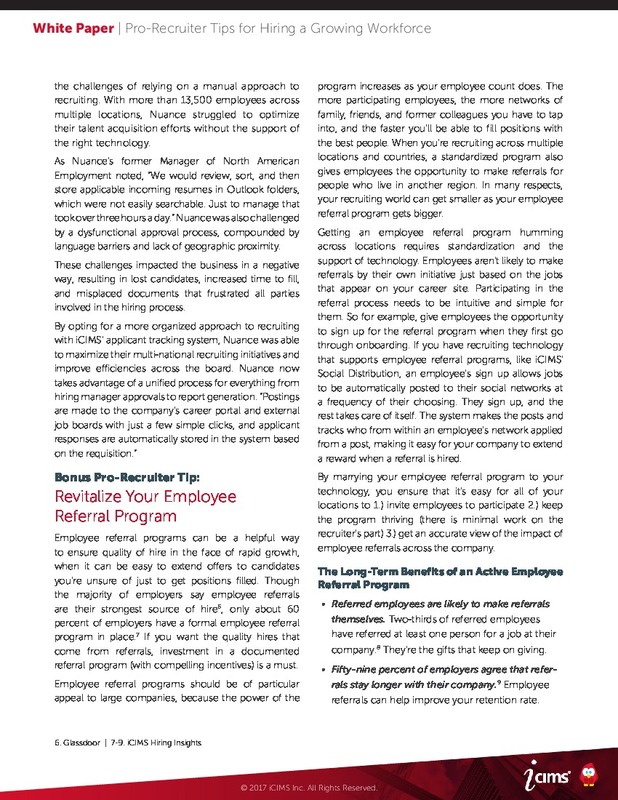 Getting an employee referral program humming across locations requires standardization and the support of technology. Employees aren’t likely to make referrals by their own initiative just based on the jobs that appear on your career site. Participating in the referral process needs to be intuitive and simple for them. So for example, give employees the opportunity to sign up for the referral program when they first go through onboarding. 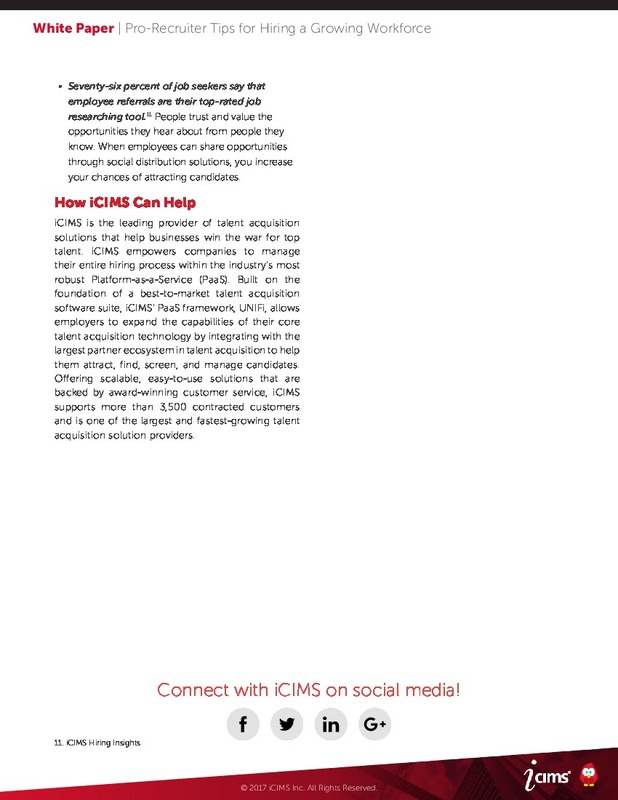 If you have recruiting technology that supports employee referral programs, like iCIMS’ Social Distribution, an employee’s sign up allows jobs to be automatically posted to their social networks at a frequency of their choosing. They sign up, and the rest takes care of itself. The system makes the posts and tracks who from within an employee’s network applied from a post, making it easy for your company to extend a reward when a referral is hired. By marrying your employee referral program to your technology, you ensure that it’s easy for all of your locations to 1.) invite employees to participate 2.) keep the program thriving (there is minimal work on the recruiter’s part) 3.) get an accurate view of the impact of employee referrals across the company. Referred employees are likely to make referrals themselves. Two-thirds of referred employees have referred at least one person for a job at their company.8 They’re the gifts that keep on giving. Fifty-nine percent of employers agree that referrals stay longer with their company.9 Employee referrals can help improve your retention rate. Seventy-six percent of job seekers say that employee referrals are their top-rated job researching tool.9 People trust and value the opportunities they hear about from people they know. When employees can share opportunities through social distribution solutions, you increase your chances of attracting candidates.